I've experimented several ways on how to make chicken in the oven that is crispy and golden on the outside, but still tender on the inside. I also love how much quicker you can cook food with your convection oven! The kids love these, and they're ready in 30 minutes! Convection roasting is a technique that crisps the outside while keeping the inside moist and tender. 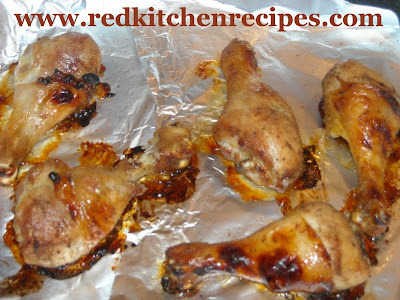 I marinate my chicken in soy sauce, garlic powder, and black pepper overnight or even for just a couple of hours. Finally, I have tested the same technique at least 3 times to find that it turns out satisfactory every time! Pre-heat oven to Convection Roast 400 degrees. Meanwhile, cover a pan with foil, and spray with a thin layer of canola spray. 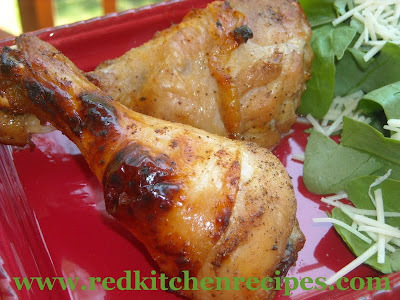 Place the chicken legs on the foil until the oven is preheated - about 15 minutes. When ready, put the pan in the oven and set your timer for 20 minutes. When time is up, change your heat to 325 degrees, then set timer for 10 minutes. When time is up, remove pan from oven and let sit for 10 minutes before eating. That sounds great, Andrew! I will have to try that! what kind of chili do you use? Thanks for the info on convection; I have a dual oven but rarely use the convection and I kept thinking that the chicken wasn't done yet because it wasn't "firm" enough. Turns out it was cooked perfectly, just juicy. I will follow this again! This looks amazing. I am trying my conv roast for the first time today. When I realized that I didn't know what I was doing, I chose this method. Can't wait to see how it turns out.